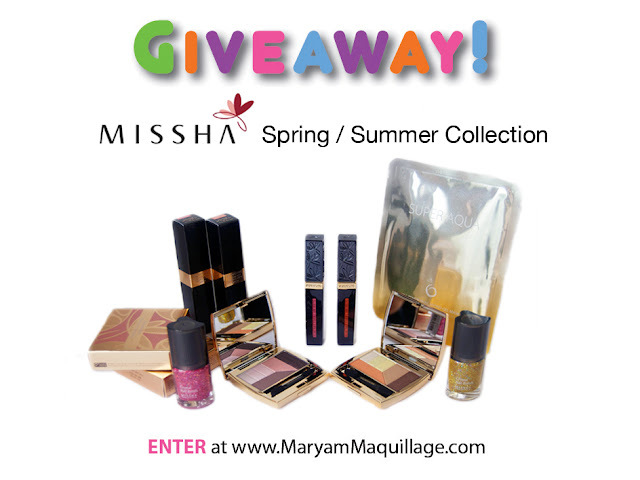 Maryam Maquillage: Spring Summer Look & Missha GIVEAWAY!!! 2 Missha 2013 S/S/ Signature Glam Art Triple Lips SPF10 Gloss+Tint+Rouge in 1 -- these lippies are innovative and unique, featuring a change of formulation with each coat. 2 Missha 2013 The Style Crystal Nail Polish -- wait till I show you my nail art!! 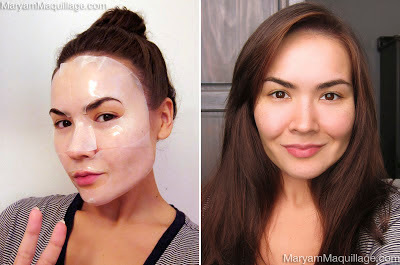 1 Missha Super Aqua Cell Renew Snail Hydro Gel Mask -- you already know how obsessed I am with these, so I'm beyond excited to have this incredible product included in the giveaway!!! Prime the lids and allow a few seconds for the primer to set. I used Lime Crime Eyeshadow Helper. 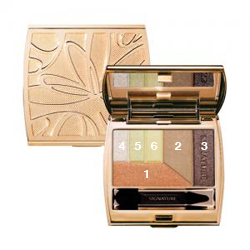 Using your finger, apply shade 6 (pale gold) to the center of your lid, right above the pupil. Missha Velvet Art shadows contain pure crystal pearl powder and can be easily applied with your fingers. Using your pinky, apply shade 5 (shimmery pale gold) to the inner corner and high point under brow arch. Top with a dot of shade 4 (sparkly pale gold). With a fluffy crease brush, apply shade 2 (neutral taupe) to your crease and blend it out using windshield wiper motions. Deepen the crease and outer "V" with shade 3 (shimmery brown with sparkles). Add shade 1 (shimmery coral-orange) to the outer and inner portions of the lid and blend the transitions. Line the top and bottom lash lines with shade 3 and sharpen the outer wing with a liquid liner. Add mascara and falsies. I'm wearing House of Lashes Le Mystere lashes -- the perfect criss-cross pair to add length and a subtle pop to the eyes. The glossiest lip product I've ever tried, "Missha Triple Lips" is gorgeous, versatile, and totally unique. The first coat glides on milky-smooth giving a natural tint effect, the second adds a high-shine gloss (without being one bit sticky) and the third coat results in a saturated lipstick finish that is glossy like nail polish!! Not Kidding... I can't wait for you to try this!!! Please read the rules carefully and GOOD LUCK to all of you!!! In love with Mambo Orange! my favorite color combos are neutrals and i love golds and orange, i have dark skin so golds coppers and orange really pop on my eyes. gorgeous for day or night looks!! So excited about the lipsticks tho! love the gold eye and coral lip! gorgeous! The maskkk! And the palettes! I love this look!!! Beautiful as usual!!!! I love the pink and purple combo's, their light and pretty but still packs an impact. The Missha 2013 S/S make-up joyful fairy look is my favorite! I'm really excited about the orange eyeshadow...it's beautiful! I love both but I think i would pick the orange palette. You makeup looks amazing!! Thank you for the awesome giveaway!!! The Mambo Orange lipstick is the perfect color for this season! Love it! The snail mask looks interesting! Love the Missha gloss!! I love both but I'll go for Orange eyeshadow palette <3 !!!! I love taupe and gold combos. Great give-away! The Missha Make-Up Graceful Muse Look (Pink Combination) is my favorite color combo! And this is also the product I'm most excited about!!!!!!!! 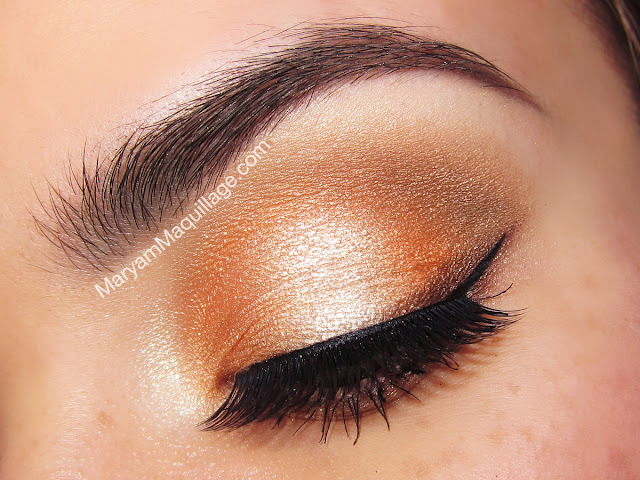 Uaau and what beautifull eye makeup...is a simple but power perfect make up look Maryam!!! !It inspires for some cool ideias!!! The Missha Triple Lips is gorgeous! I'm excited for that the most! I love everything you share--and I love that you comment when I ask questions/post pics. And I got a bunch of my friends to follow you on FB too!! I love the orange combo!All products are awesome!!! I'm most excited about the Missha Triple Lips! I love the face mask!! It works great! I am mostly excited about the joyful fairy look and the triple lips. I love the graceful muse pallet. So pretty !! Love the joyful fairy pallette but the mambo pink for lips and I'm VERY excited about the Glam Art Triple Lips. Can't WAIT to try it!!! I absolutely love the lip color on you. I'd love to try out the mask too. Loving the pinks, i never ever win anything, maybe just once i'll win! I am most intrigued by the gold and pink nail polishes, and the Mambo Pink Gloss + Lip Rouge. The Mambo orange lipstick looks gorgeous!!! I love the cool toned/pink combination! However, the orange one looks pretty as well, they both look fab!! would love to try these out! the eye makeup looks so pretty! I'm not usually a fan of orange...anywhere on my face but that mambo orange is REALLY pretty! I love it! It goes great with the Joyful fairy look that you have! I am most excited about the eyeshadows! I like the orange eye shadow palette, and also the orange lip gloss. I love navy and lilac together...I'm excited for the nail polish! I absolutely LOVE the Mambo Orange!! I love Missha Mask I'm obsessed with them the Missha Super Aqua Cell Renew Snail Hydro Gel Mask looks incredible. The eye look is also really pretty I want to try to recreate it. Love the Missha masks. Also, Black Sugar scrub - for my face as well as a lip treatment! I've purchased from Missha and they have the best products. The ones in this giveaway look great! Totally love the pink combo! Very pretty. The lip products look great too. I like the orange combination! And I'm most excited about the lipstick, which looks really pigmented and glossy. you do such a beautiful job of blending and making this look effortless (true sign of a makeup goddess!) ty so much for the opportunity to enter & WIN!!! yay! good luck to all the ladies! i OVE missha's bb creams and skin care - looking forward to playing! I am in love with the mambo pink! The orange combo and the gel mask look really exciting! Fingers crossed that I will finally win a giveaway! love the gold and brown shadow combo. and really love that mambo pink gloss. So hard to choose, they are all beautiful! 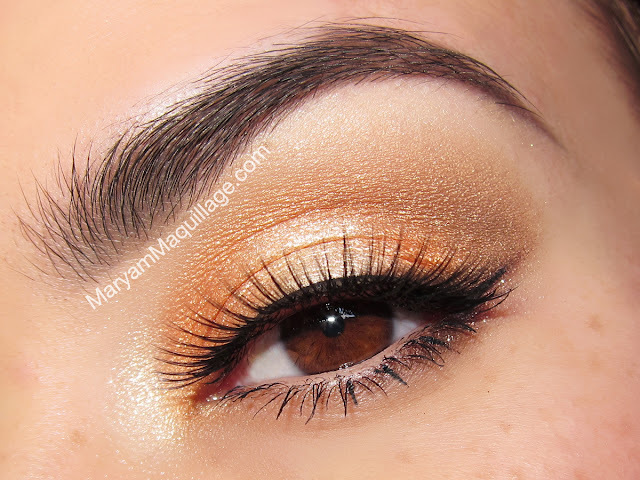 I would love to win the Mambo Orange set, it would suit my warm skintone and blue eyes. Love the orange set and the mambo pink lipstick and gloss! Would so love to try this lipstick/gloss!